Growing up as a child of the eighties I am still very fond of my old video game collection. From console games to pc games, you name it. It's amazing how happy we were with so simple graphics! I played hours and hours on some games and still didn't get bored of it. Usually a newer more fascinating game was bought and then I would fixate on that for a while. I always played games on the pc of my parents business. But since they needed it for work, I couldn't play much on it. 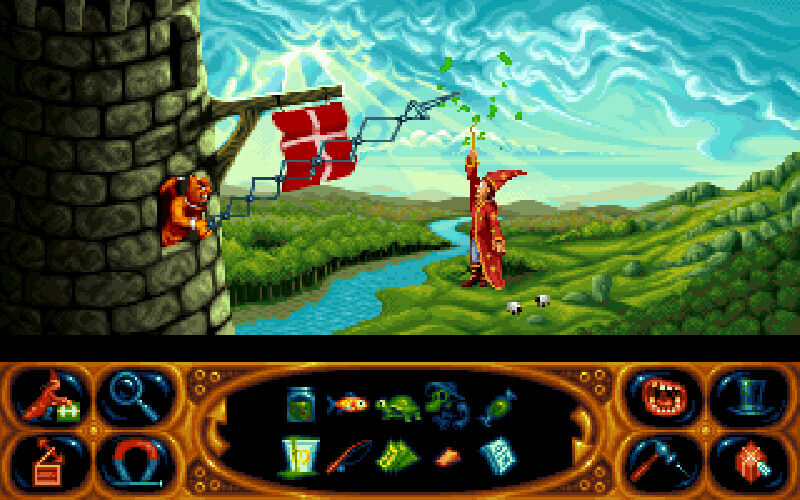 The first game she bought for my new pc was Simon The Sorcerer 2. This game, was unlike all other games I normally played. I mean you had to think about your options, needed to be inventive unless you just liked clicking everywhere. I absolutely loved it, this interactive story driven puzzle challenge! 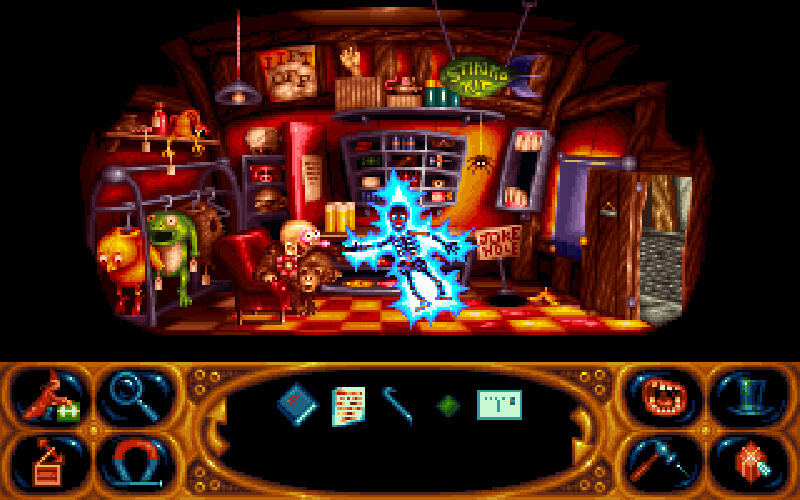 The genre to describe Simon The Sorcerer is called point and click adventure. 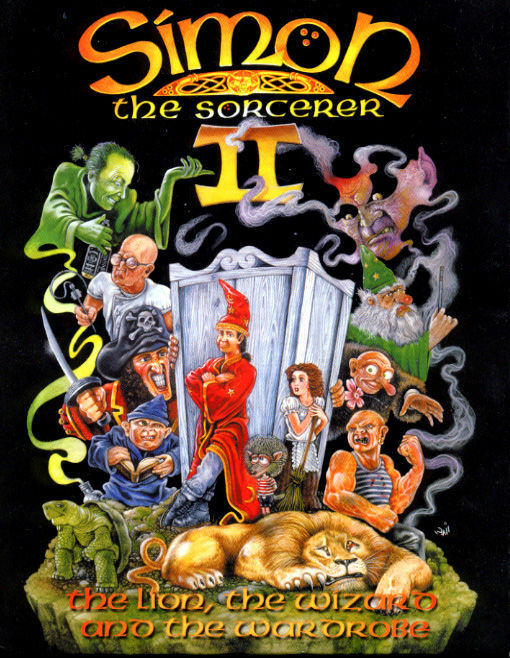 So my mom bought Simon The Sorcerer II based purely on the funny artwork on the packaging. Who would've thought that from that moment on I was hooked on the genre? 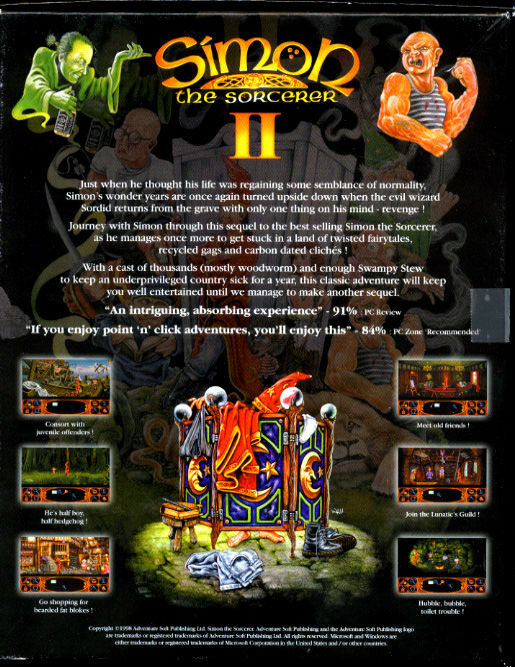 I never played the first Simon the Sorcerer game, mostly because I didn't found it at that time. The game is an interdimensional adventure where you crawl into the skin of Simon. So who's Simon? Well, Simon's a rude and obnoxious but somewhat regular English teenager, that likes to insult people. And he lives in our dimension. In the first game Simon travelled to another dimension and had to rescue a good wizard named Calypso from the clutches of the evil sorcerer Sordid. And in the end Sordid was defeated by Simon. 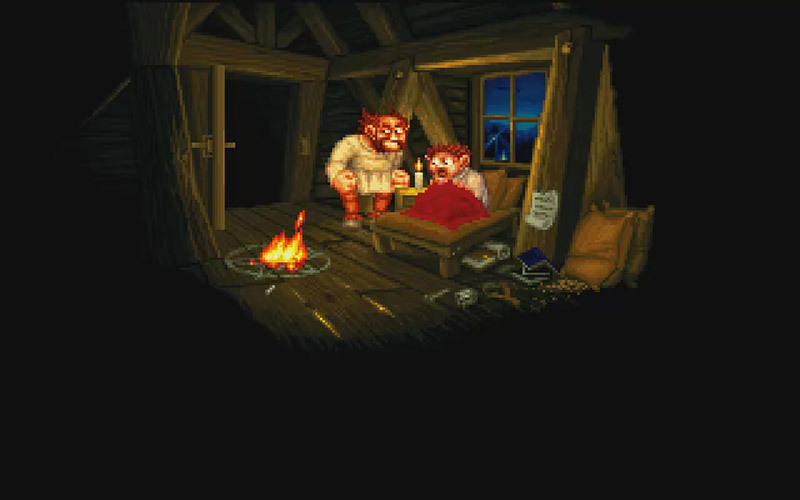 The second game storyline builds upon the first and so it starts with a young peasant boy called Runt. Runt, who's obsessed by becoming a powerful sorcerer, is sneaking around with an old magic book. A magic book that happens to be written by the infamous Sordid. Suddenly Runt's father walks in and catches him with the magic book. Angry as he is, his father lights up the book and tosses the thing onto the chalked pentagram on the floor, not knowing what he has done. The evil Sordid's spirit appears and he makes the boy his apprentice. Taking a few months to rebuild his castle and to transfer his spirit to a robotic body, Sordid is now back. Only to take vengance upon Simon and make him pay for his former defeat. To do so he puts a magical wardrobe in Simon's bedroom, to retrieve him from his dimension. Simon totally unaware of course, accidentally stumbles into that magical wardrobe that just happened to appear. But not all goes according to Sordid's evil masterplan. The magical wardrobe appears on the doorstep of Calypso's magic shop instead. 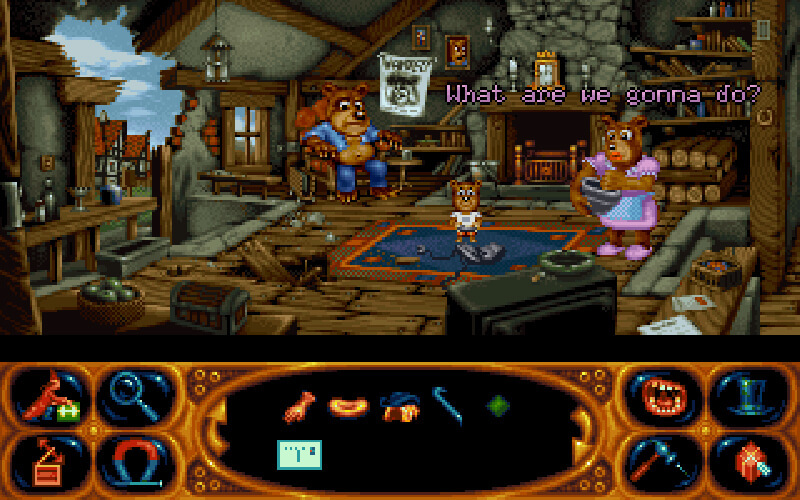 Everyone, including Simon is surprised and disappointed that Simon is back in their dimension. But nevertheless Calypso informs Simon that the wardrobe has run out of fuel. And without fuel it is just a plain wardrobe. So that's it, now Simon can start his quest to get back home! 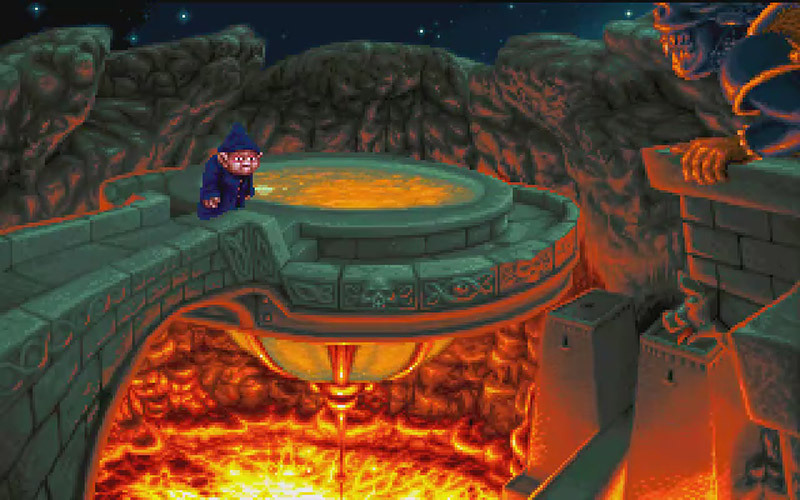 The Simon The Sorcerer game's full title is: The lion, the wizard and the wardrobe. This actually refers to The chronicles of Narnia. The series has a bunch of parodies on well-known fairy tales and fantasy books. I think I also recognized Jaws from the classic James Bond films somewhere along the game. And definitely a parody of MacDonald's. So the only thing left here is a question for you, my dear reader. Yes, you! I would love some feedback on this post did you like it? 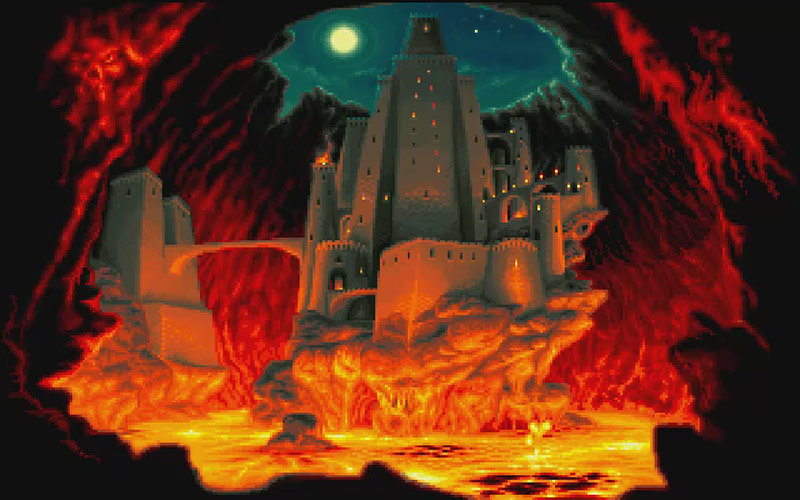 And would you enjoy reading more posts about old school games? You can answer any way you want, press the appreciate-button, send me a message on twitter or through the contact form or just comment directly on this article.